Lock in a great price for The Gables Guest House – rated 8.7 by recent guests! we really enjoyed are stay the room was cozy and breakfast was great . Very friendly establishment who prioritise customer service. Great refurbished space with the essential amenities. Great location right in town. Lovely breakfast- veggie options available, good portions, served nice and quickly. Free parking in the small car park or on the road just outside if you are lucky. Nice clean rooms. The Gables is set literally in the heart of Ambleside and comes with free parking outside. On entering the building you are met with a modern interior that is clean and up to standards. The rooms are modern, warm and comfortable and whilst not tested (left very early in the morning) the breakfast area looks highly commendable. On an evening you are right next to the local restaurants including the usual fish and chip, pubs, Indians and Italians. Location and cleanliness excellent. Breakfast very nice. Ample tea and coffee etc. Town has a lovely atmosphere about it. Nice xmas decorations. The freshly cooked breakfasts are very tasty. Milk is always available for guests in a fridge in the dining room. Our room and en suite had been recently decorated and the shower was luxurious. Even though we were on the ground floor, right by the road, the room was quiet. Nicely modernized building with comfortable and clean rooms and great views of the Hills. Well organised and high quality breakfast individually cooked to your taste in good time with very attentive waitress service. Location right in the heart of town with easy access to shops/restaurants. Also easy to walk from the location on to the hills without having to drive. A very nice place to stay, would strongly recommend. The Gables Guest House This rating is a reflection of how the property compares to the industry standard when it comes to price, facilities and services available. It's based on a self-evaluation by the property. Use this rating to help choose your stay! One of our top picks in Ambleside.With wonderful countryside views, this stylish hotel is 2 minutes' walk from the center of Ambleside. It offers free Wi-Fi and a tasty breakfast. All the bedrooms have private bathrooms and hairdryers and guests can enjoy free tea and coffee making facilities. The Gables Guest house Ambleside has a spacious dining room providing traditional English cooking with continental and vegetarian alternatives. Locally sourced products are used where possible. Secure bike storage and drying facilities are available at the property. 뀐 Located in the top-rated area in Ambleside, this property has an excellent location score of 9.2! 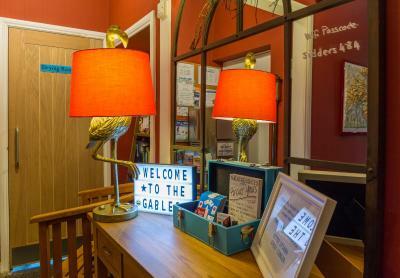 When would you like to stay at The Gables Guest House? Located across the 3 floors of The Gables, these individually styled rooms are of varying size, but all feature an private bathroom and views of Ambleside. Please note, this room can accommodate a maximum of 2 adults and children cannot be accommodated in this room. A ground-floor room featuring a flat-screen TV, free tea and coffee and an private bathroom. Each room has an private bathroom and overlooks the bowling green at the front of the building. With windows overlooking the bowling green and Loughrigg Fell, this room boast contemporary style with Sandersons Dandelion Clock detailing. This stylish room also features a luxury four-poster bed and a chaise longue. House Rules The Gables Guest House takes special requests – add in the next step! The Gables Guest House accepts these cards and reserves the right to temporarily hold an amount prior to arrival. Please note that late check-ins (after 20:00) have to be arranged at the time of booking. Please be aware that the property is unable to accommodate late-check out requests. Please inform The Gables Guest House of your expected arrival time in advance. You can use the Special Requests box when booking, or contact the property directly using the contact details in your confirmation. Breakfast is subpar with your canned fruit and packaged toast bread. So many nice bakeries around! Very cold no heating and no one to ask to put it on. No parking when we were told there would be. Friendly welcome. Great breakfast. Room clean and comfortable although small. Bathroom clean and has complementary toiletries. Information booklet very ‘informative ‘. The room wasn't bad, it just seemed dull and a bit on the small side, also the breakfast was a bit underwhelming. The hotel is located right in the center of Ambleside so all the bars and shops are within a 5 minute walk. The hotel is a nice building, very clean and I can't fault the staff, they were friendly and helpful. Staff could have been slightly.more welcoming. Booking.com pricing is like a lottery could have booked for £25 less. The bathroom could have been warmer! Parking can be a problem at busy times. WiFi was very flaky and you had to move around the building to find a decent connection which often disconnected. There was 4G (slow) throughout so it was possible to do a bit of Internet stuff but perhaps not ideal for those wishing to connect to work for a power hour before heading out. The fan in the bathroom was noisy and continued after leaving the bathroom. There was no stand in the room for a suitcase. There were too many pillows and cushions on the bed. Small things. I was lucky to have a room with a bay window, which I presume made it slightly larger than other rooms. The room and bathroom were well equipped. There were plenty of power points in the room for charging devices. The staff were friendly and helpful. The breakfasts were generous. The location was very central.